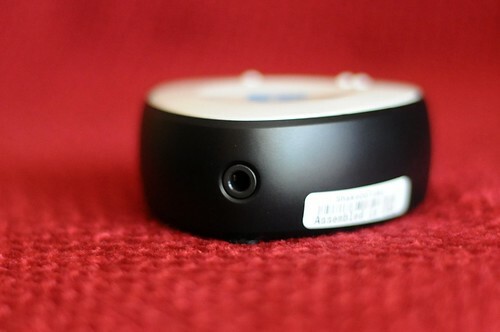 The Tune Bug Shake is a small portable speaker that takes the place of headphones or earplugs. It uses a standard 3.5mm audio jack that plugs from your mp3 player into the Tune Bug Shake. 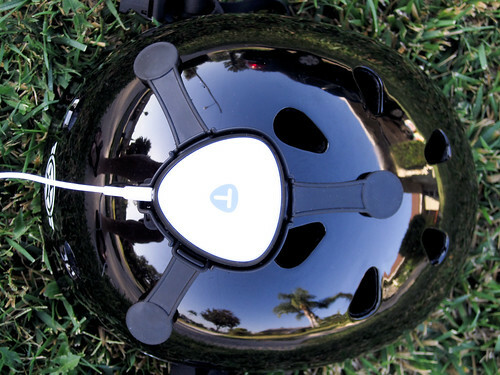 The Shake can then be mounted onto a normal vented mountain biking helmet or a skater type helmet as well. Power up your mp3 player and you get music from the Tune Bug Shake (msrp: $119.95). Tune Bug Shake, small, clean design with just two buttons… very Apple-esque if you ask me. When I ride solo I like to have my mp3 player with me. I enjoy rocking to some tunes when out on the trail but doing this has its downsides: not hearing what is going on around you, ear plugs falling out or moving around at inopportune times and having so many accessories and necessities in and around my ear. 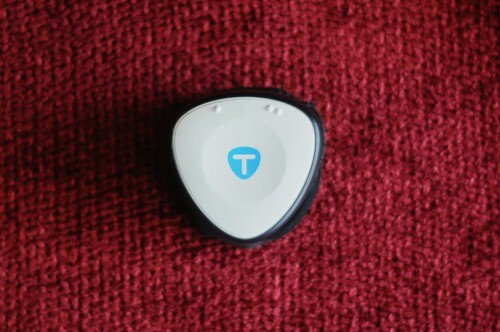 With the Tune Bug Shake I am able to eliminate all of these problems which makes this device pretty cool in my book. Not being able to hear what is going on around me is probably the main reason I have enjoyed the Shake. I HAVE to be able to hear what is happening on the trail. With earplugs I lose out on this even when the volume is very low. I have a difficult time hearing people communicate with me and I feel disconnected since I can’t hear the tires on the trail. I have had more than my share of people scare the crap out of me when riding with earplugs but with the Tune Bug Shake I am able to hear the surrounding sounds including the other riders or hikers around me. I also hear the tires as they interact with the trail helping me be in tune. Sorry, I had to. The Tune Bug Shake has also eliminated the ear bud falling out of the ear problem. I have tried a variety of different ear buds: buds, buds that wrap around the back of your head, buds that wrap around your ear… all of them have a tendency to become dislodged at inopportune times. When using the Tune Bug Shake it always stayed on top of my helmet except for the one time I crashed and I found it on the trail a few feet away, none the worse for it. When riding, it doesn’t add much weight; definitely not notice-able after you put the helmet on. Lastly, the tune bug eliminates having anything on my ear. With ear plugs, sunglasses, a head sweat band and a helmet I can have a lot going on in and around my ears. This occasionally led to minor headaches while riding and I normally had to give up on something… usually the music. With the Tune Bug Shake I am able to keep the necessities while still playing my music too. I did find that the Tune Bug Shake’s sound quality was not as good on a vented helmet as it was on a skater type helmet. The sound on a vented helmet had more treble and needed a bit more bass but it was still listen-able. I would also prefer to have a wall charger rather than a USB charger but it does charge quickly. These issues are a small price to pay for all the advantages the Tune Bug Shake brings to the table. Although sound quality is better on a non-vented (skater type) helmet, I would still listen to the Shake on my vented helmet. 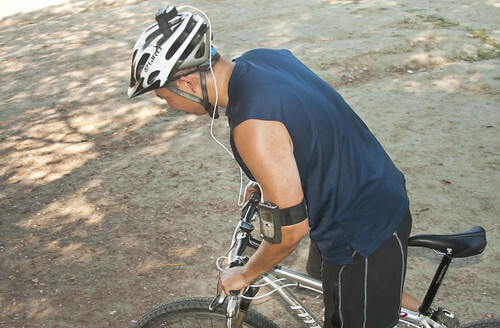 The Tune Bug Shake is a great, safe way to play your music while on the trail. For more information on the Tune Bug Shake, click here. Wow – the view from the top kinda looks like a Martian probe was launched at your head and a small mind destroying robot pops out and crawls into your ear slowly captures all your memories and….ugh, never mind. WOW $120!!!! I was wondering if you could put it to the test against the $40 Azonic surround sound helmet(Dj/park/skate style) I have been using that for such a long time and well you would never know the difference from a reg helmet because the speakers are built into the helmet and not a huge mass on the top. Also I know headphones and even my Azonic helmet sound different depending on the audio source… like when i had my Iphone… not much bass, but plug in my Microsoft zune and my helmet sounds richer.